Day 1: Lemosho Gate – Mti Mkubwa. First up was a trek through an unusual equatorial forest; unusual mainly because of the masses of tropical moss that hang down of the trees. 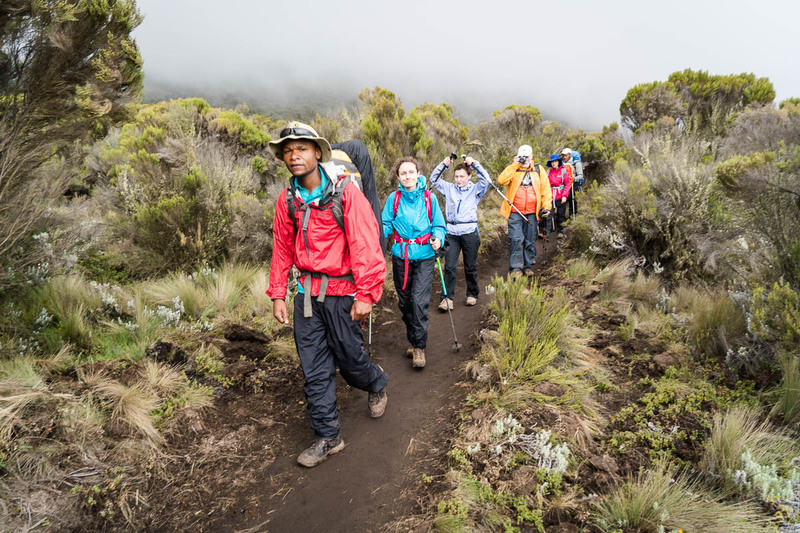 Same forest also gets very wet with frequent rains, so waterproofs are a must – as are waterproof backpacks with tents and sleeping bags inside! Late afternoon, we arrive at our first campsite. Altitude 2800m. Wet, dirty, with our tents pitched on mud. Hmmm. On the brighter side: monkeys all around up in the trees! At times they climb down to seek out food in the camp – and make friends with the new tenants. 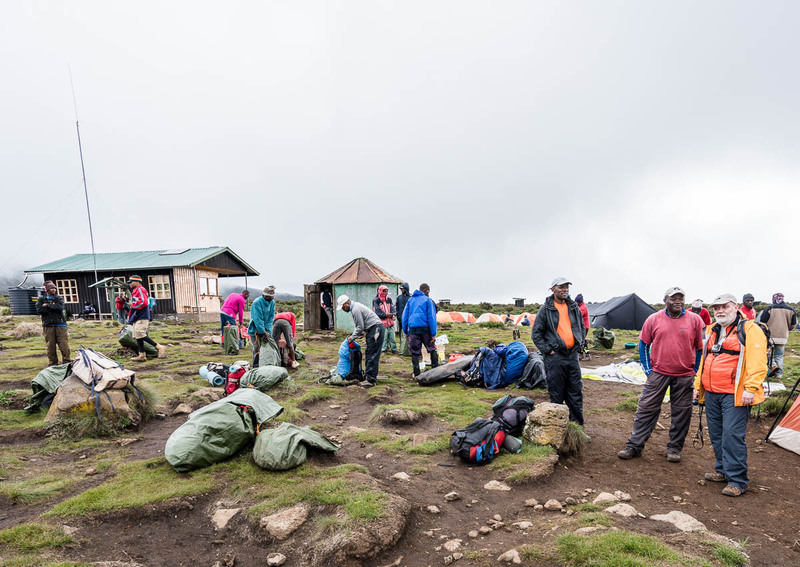 Day 2: Mti-Mkubwa – Shira 1 (lunch) – Shira 2 (overnight camp). On day two the tempo was decidedly slow, and with lots of stops for (literal!) breathers – not because we were lazy or anything, but because we’d risen above the tropical forest and entered some kinda oxygen-scarce tundra-pampas. Going at full steam ahead would have been foolish: we didn’t want any altitude sickness. But on we marched – slowly – the only way to go: up! Day 3: Shira 2 – Lava Tower – Barranco. But the idyllic scene didn’t last long. All of a sudden a strong wind blew up and a cold rain began to pour down from magically appearing clouds. Hmmm. Miserable. Made more so be there being so little oxygen up here – at 4000m+. At Lava Tower things were even gloomier: dense fog, more rain, and air thinner than… Kate Moss. Everyone’s mood turned decidedly depressed. But wait! OH NO! That sounds like the second stage of altitude sickness! So we all buckled down to concentrating on the positive: to remember what adventure and achievement lay ahead. That helped a bit mood-wise, but still, it was deemed we needed to descend a bit to get out of the way of this ominous spot of bad weather; that way the acclimatization would be steadier, safer. And who were we to argue? Along the valley from Lava Tower down to the camp below we came across some unexpected flora-endemism. Our guide reckoned that these unusual though thoroughly charming trees were Senecio, though Wikipedia seems to disagree with her :). But it doesn’t matter what they’re called. Main thing: these plants/trees are just awesome! 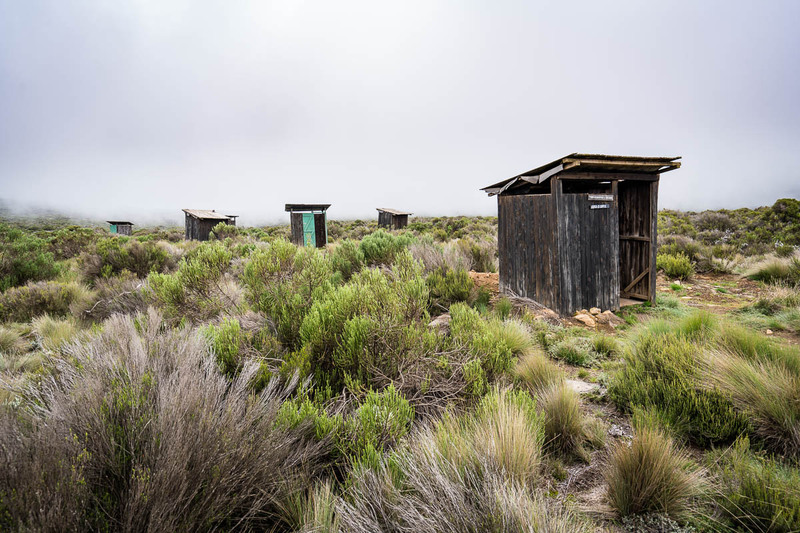 On the horizon, our next camp – Barranco. Next up for us was a climb up that there vertical mountain in the below pic! Oh my goodness gracious. When we were told such news a strange silence fell upon the group, faces suddenly turned paler, and stomachs became knotted. Day 4: Barranco – Karanga. The climb up lava wall. 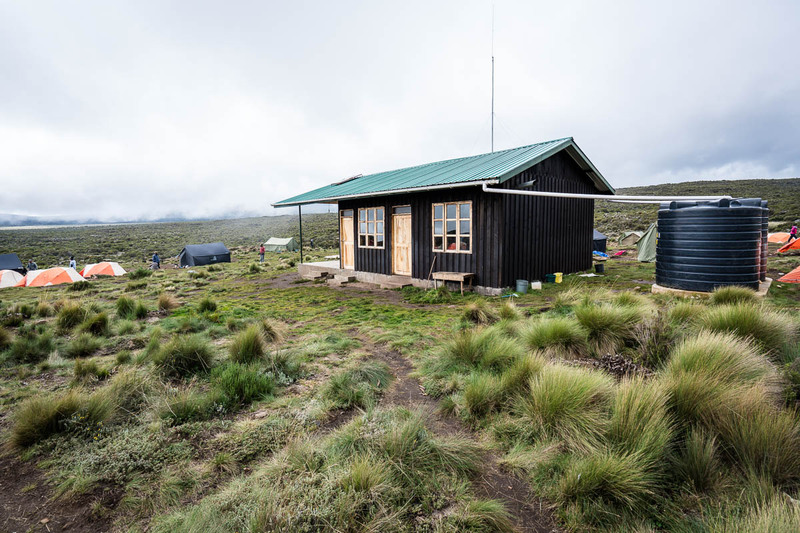 And here were are – in Karanga camp! And next day was straightforward enough. We needed to cover just three kilometers of fairly easy terrain. Mostly plain sailing, despite the uneven ground underfoot. Lots of rest stops, lots of photo-taking… all added up to a speed of less than one kilometer per hour! 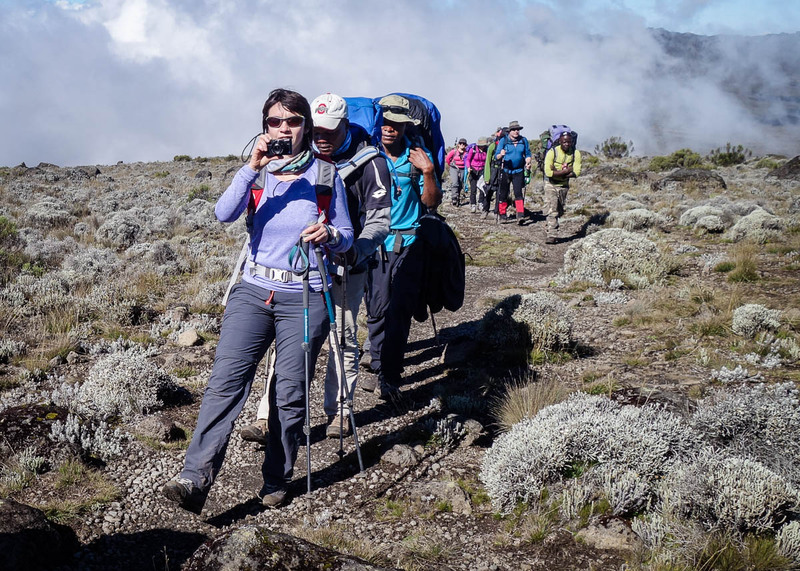 Remember: when going up Kilimanjaro – slow is best. 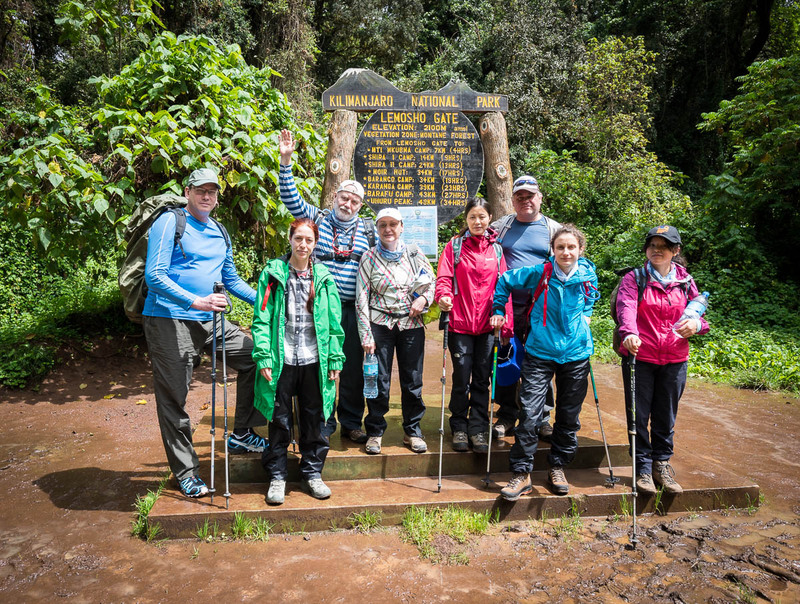 Day 5: Karanga – Barafu. Distance: Just 3km, but a very beautiful 3km! Flora disappears to leave a bare stone-and-volcanic-slag landscape. Only the odd clump of hardy grass is to be seen in terms of vegetation. This signifies we’re finally here – up in real mountains – real high mountains. Nothing but rocks, snow, ice and tourists – all in a bitter, biting cold. Here we are in the base camp. From here it’s up to the summit! Main thing: don’t panic, breathe deeply. Day Night 6: the ascent to the top. This was a first for me: a nighttime climb to the top of a tall mountain. 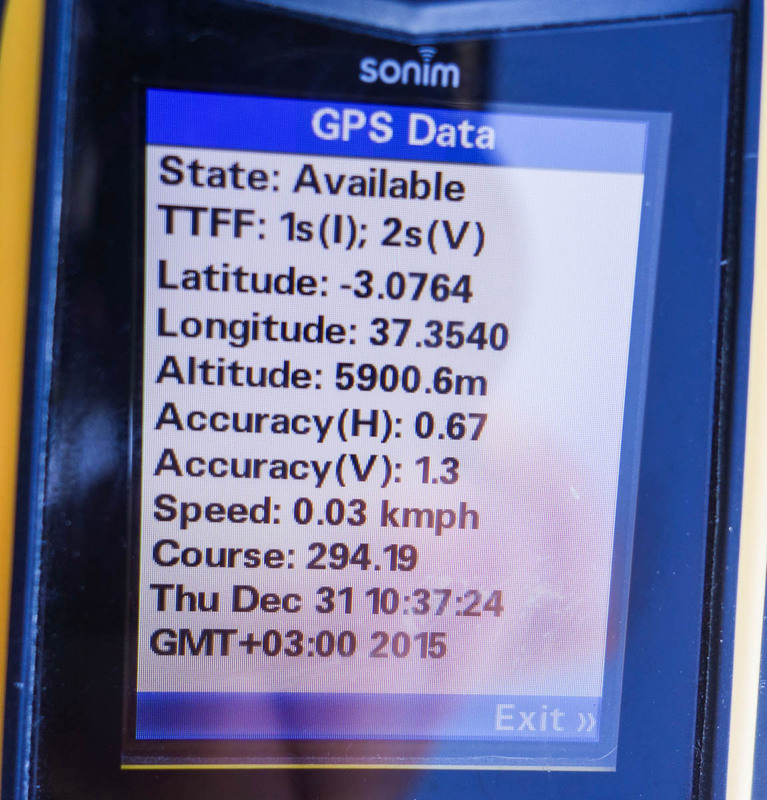 And this altitude: a personal record. At first the going was ok – steady away, just the darkness being a bit unusual. 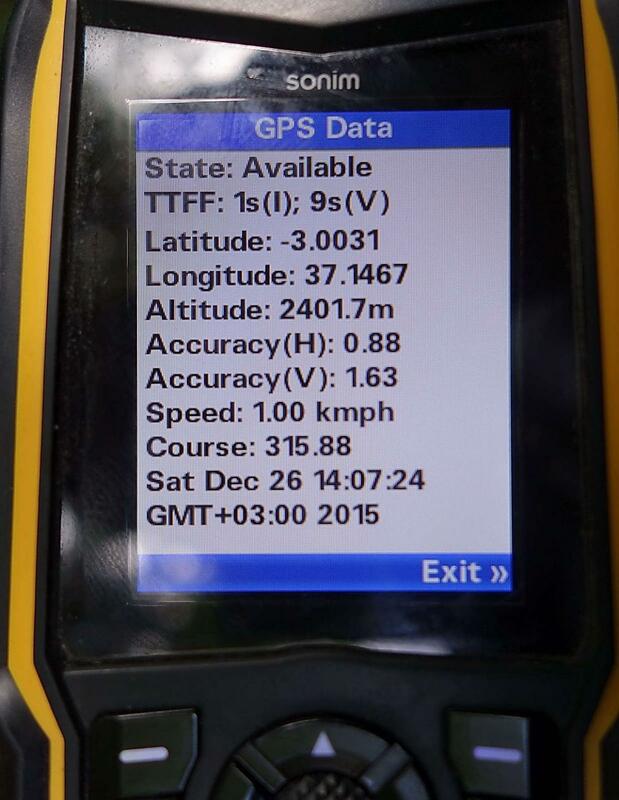 Then, once we’d passed the 5000m mark, things suddenly became difficult. Cold, tired, thin air… But it was the last stretch that was worst of all – an ascent of some 900m, in the middle of which a cold hurricane started blowing. It was then when I understood why we were all kitted out in warm mittens and hats and coats. 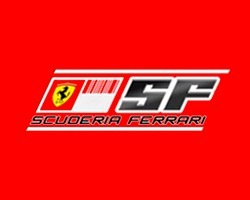 Who’d have thought it – in Africa? Here at the very top – all our local guides in full formation: all present and correct, sir! 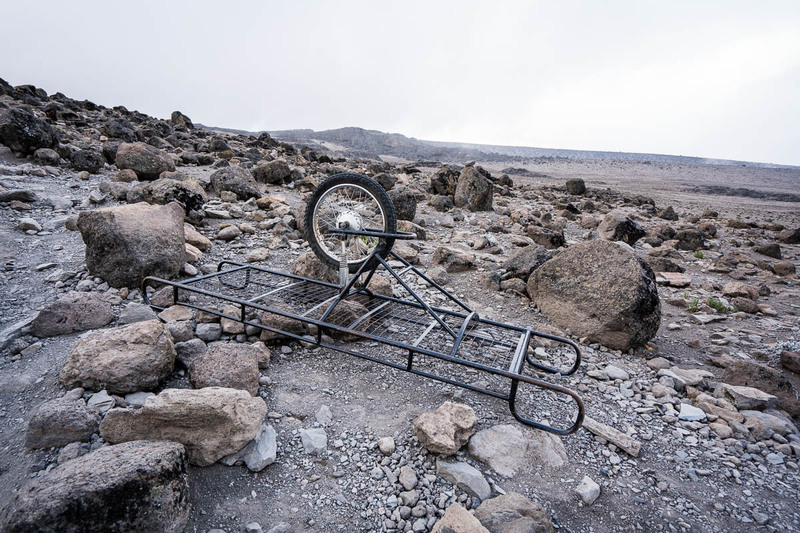 So that’s how we went up Kilimanjaro! Ooh, and look, it’s New Year’s Eve! What better way to end one year and begin another than being nearly 6000 meters up an African volcano? And then saw in the New Year in suitably triumphant and celebratory spirits. Hooray!! 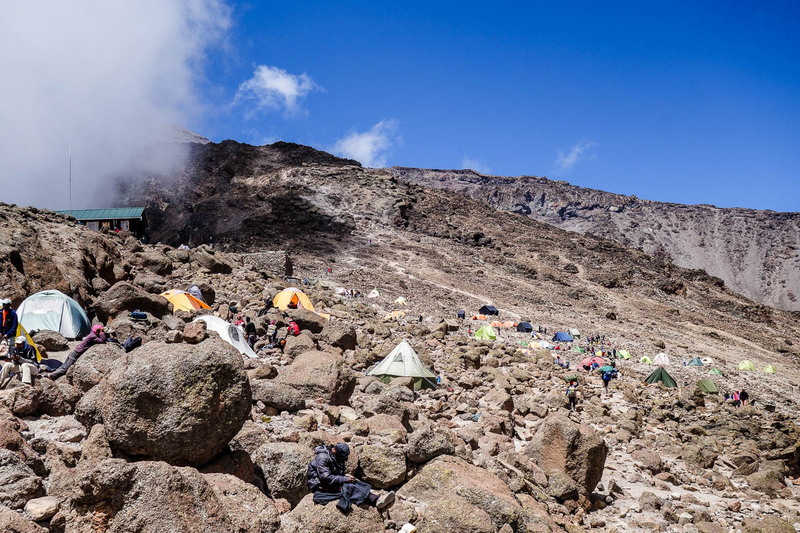 Kilimanjaro Statistics state that only 45% of those starting out actually make it to the top of the volcano. Interestingly, the longer the route you take, the greater the chances of success. 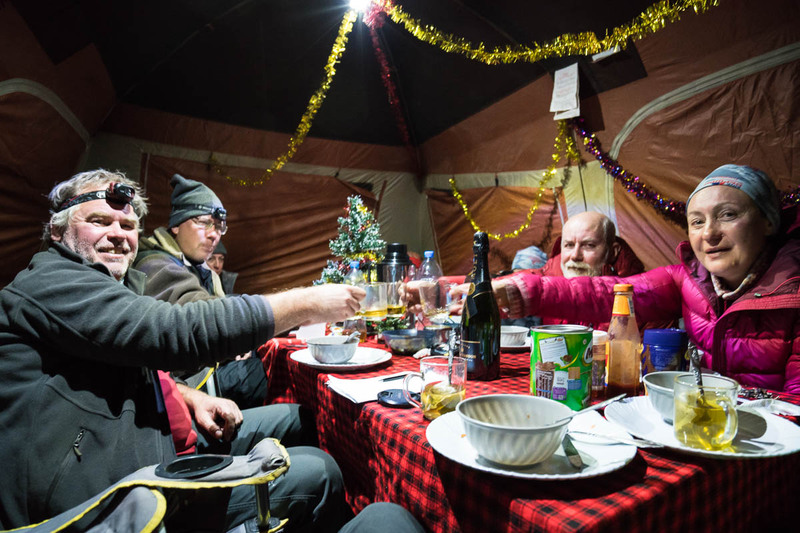 For example, on the fast-track five-day route, the likelihood you’ll get to the top stands at just 27%, on our seven-day route it’s 64%, while on the eight-day route it’s 85% (the eight-day route is our route + a night stopover at Shira 1. At the outset at Lemosho, our group consisted of eight tourists + one (Moscow) guide + four local guides + around 30 porters. Later on, at the base camp, one lady gave up and went no further. (Told you it was tough!) Later, another lady couldn’t drag herself up to Stella Point (on the edge of the caldera). I mean, really couldn’t – altitude sickness had gotten to her. So she was carried up the last leg by the guides – at least then she could say she’d been there. Then she was sent back down below – swiftly. She took her couple with her and KL flag too :(!! So, out of our group of eight, five made it to the very top. That makes 62.5% – higher than the average. Hooray! 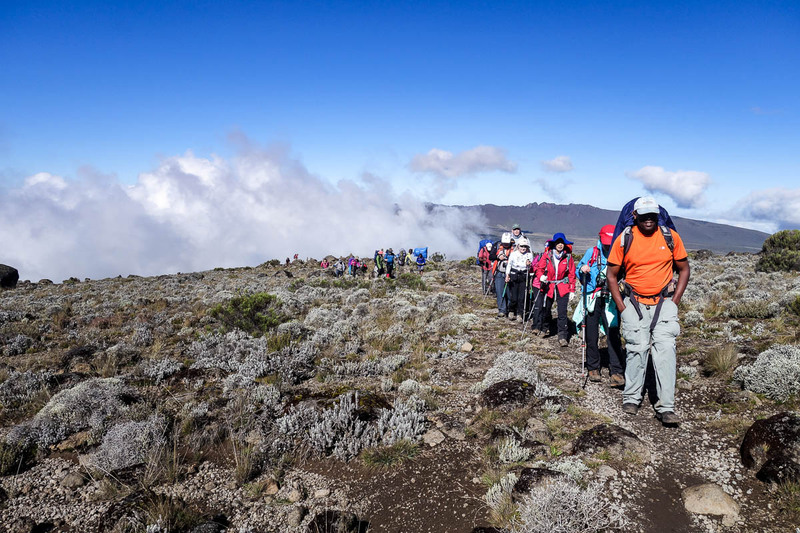 The highest point of Kilimanjaro is the caldera of the old volcano. 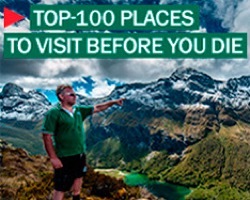 This is where tourists tend to be taken. But inside the caldera there’s the cone of a new volcano – a fresh cone, just a few hundred years old (I think), but this cone isn’t easily visible from all points. 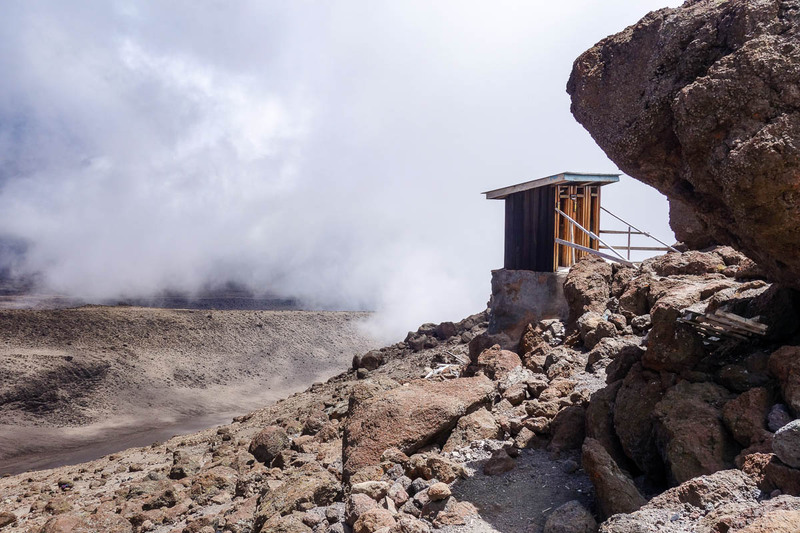 Accordingly, ideally you need to spend the night in the caldera to be able to then investigate the new cone properly next day. 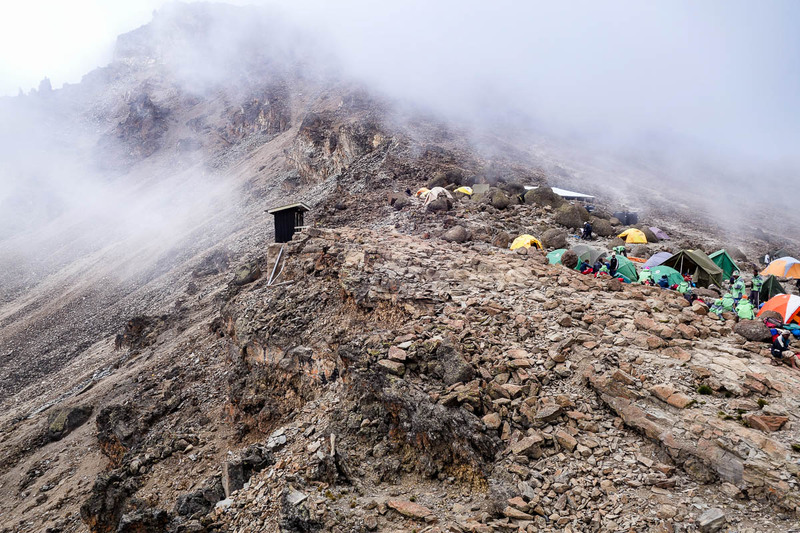 So, to me, to ‘be at the top of Kilimanjaro’ really means to be at the top of this newer inner cone. 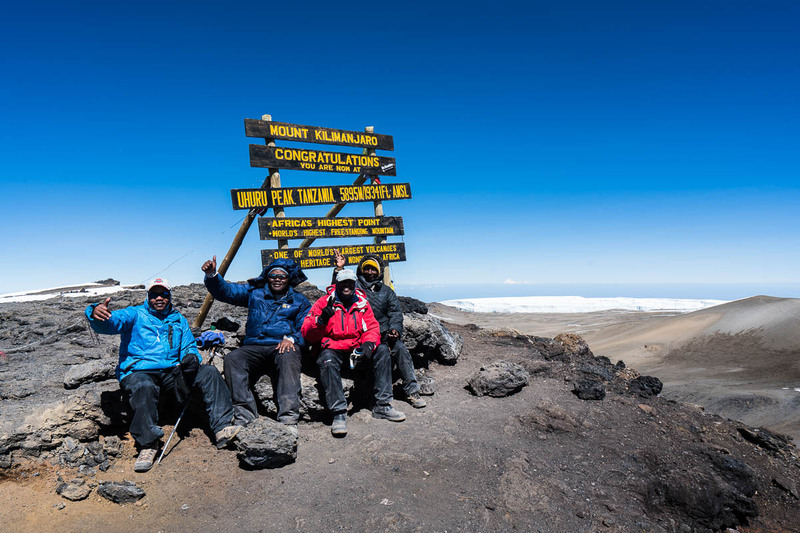 Just as well: gives me another excuse to come back – for the full, real, genuine Kilimanjaro experience. 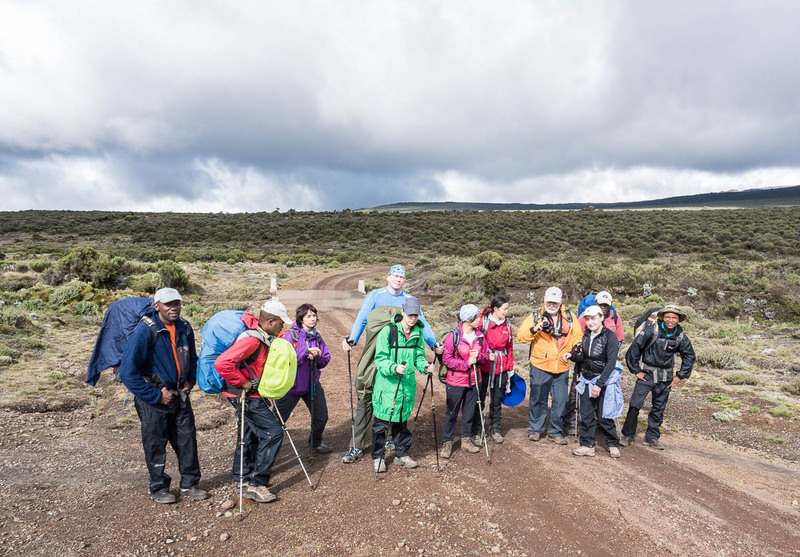 The rest of the photos from our Kilimanjaro expedition are here.